Bit of background- I teach pupils with profound and multiple learning difficulties in my day job, a job I absolutely love. 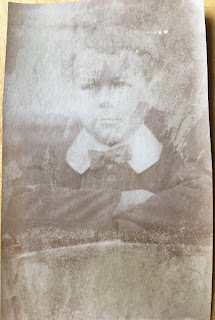 I also love Victorian history and photographs (which comes out in my art a little) so for me combining the two is twice as interesting. Mencap have described people with PMLD as one of the most excluded groups in society (Link) and I agree with that statement. I am aware as an educator that we have only really been properly educating this group for the last forty years or less and as an amateur historian I am also aware that this group and people with a disability in general have been institutionalised and marginalised throughout history. 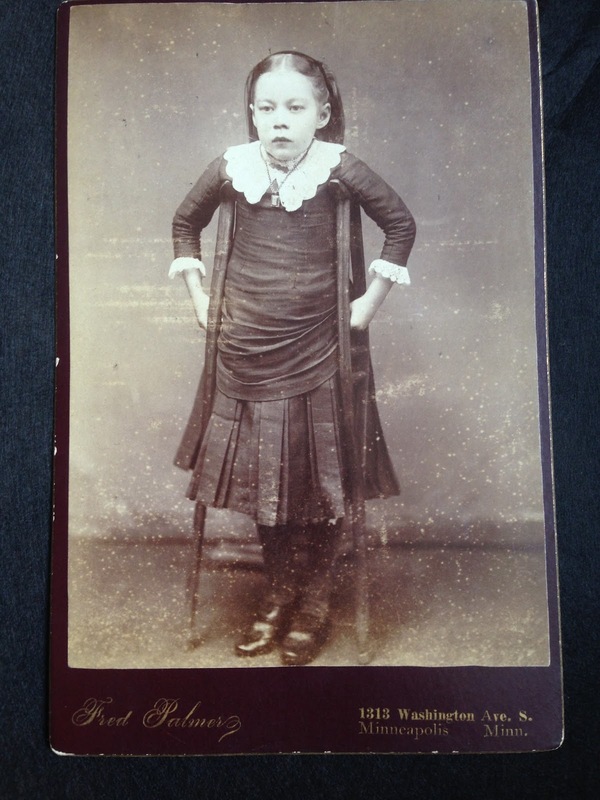 It has been a pleasure then to find these photographs of children and adults with 'special needs' or a physical disability as they are not photographs from institutions but family photographs. This little girl is my favourite, from the photographer H J Taylor of 243 Kentish Town Road. Date wise I think it's late 1870's or early 1880's- the photographer moved to 335 Kentish Road at some point (possibly 1890's) but I can't tell if that was after or before living at 243. Medically speaking I think she has nystagmus- hence the sideways gaze at the photographer and her hand position is interesting too but apart from that it is hard to make any specific medical diagnosis from one snapshot. This is also a 'hidden mother' card as you can just see her hand behind the girls back on the left side supporting her. Cabinet Card, back is blank. 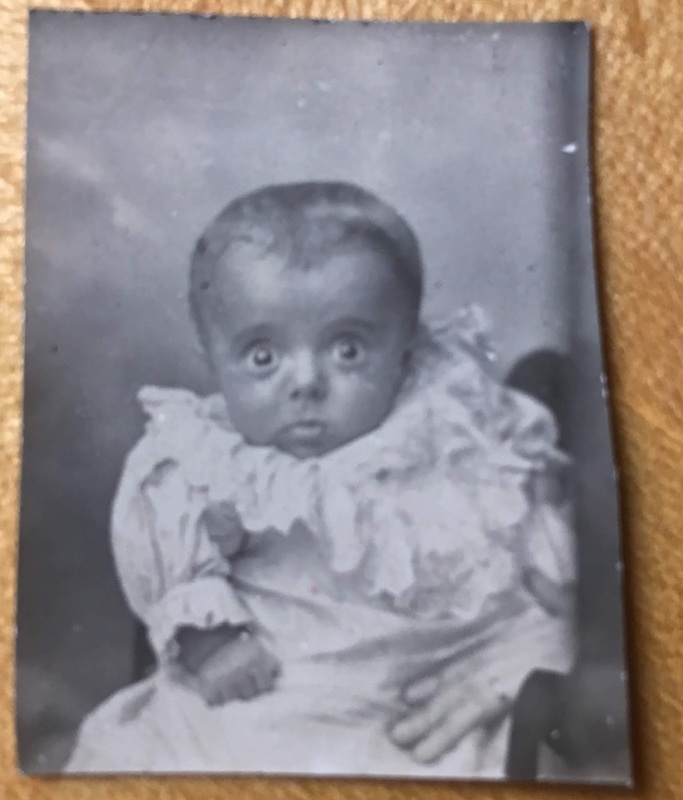 This baby is from Brynamman and the photo taken by William Rees, Chemist and Photographer, I think it dates to around 1895 and the boy (pretty sure it's a boy despite the dress- babies were often dressed the same in Victorian times weren't they?) 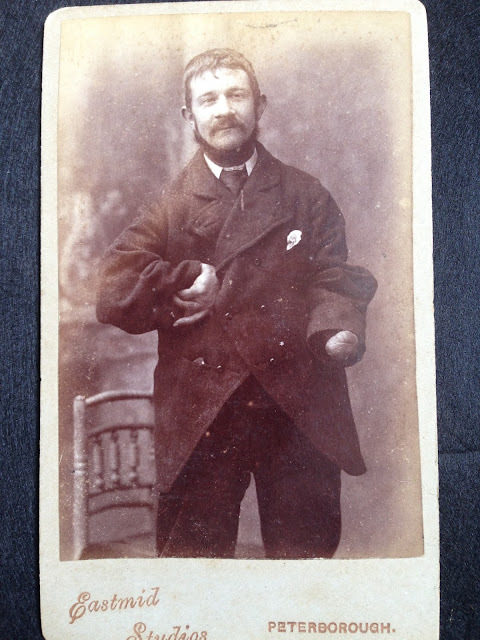 has Down Syndrome, which was only identified in 1866 by Dr John Langdon Down, who worked at The Earlswood Asylum. It's a cute photo with typical ornate chair and furry rug background. 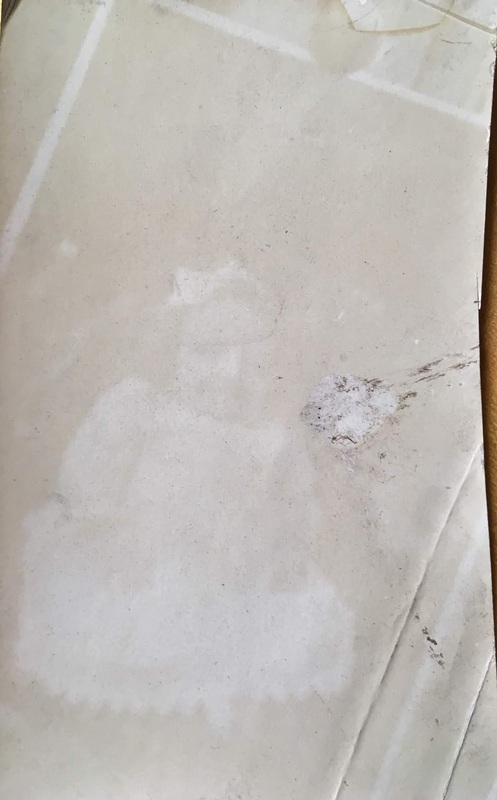 Cabinet Card, back is blank. 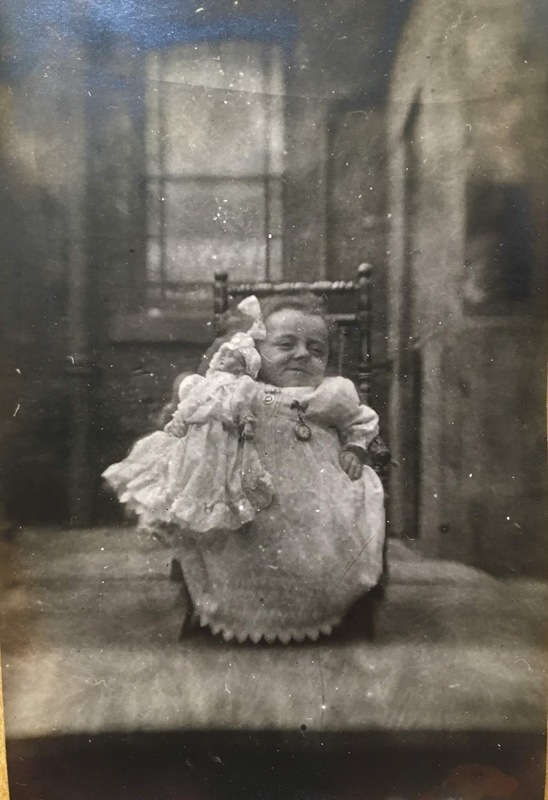 These photographs are rare as there are more of one of the same individual. 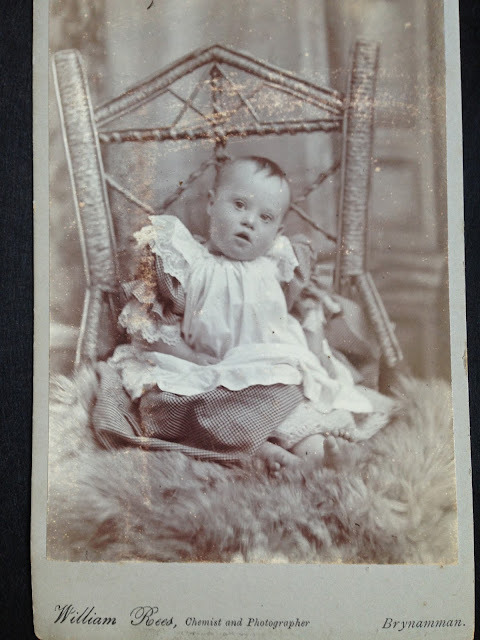 Here is the girl as a baby, note the mothers hand bottom right supporting her. This is a tiny passport sized photo and technically not Victorian as it probably dates 1900-1910. 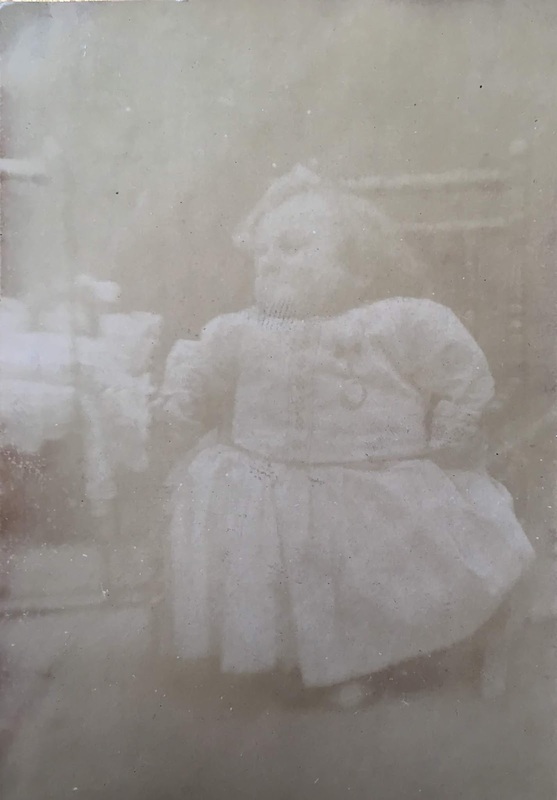 Here is the same girl a few years old- about four or five? The photo has been taken around the back of a house, note the coal shovel against the wall on the right. She is also sitting in front of a backdrop of what looks like a painted aerial view of a landscape. Note the cute cat toy she is holding! Again the same girl a few years later- looking about 6 or 7 I'd guess, taken around the back of a terrace house. The girl has a lovey doll and also a little fob watch on her dress! The chair she is sitting on is the same as the one in the previous photograph. These two photographs are unfortunately faded. 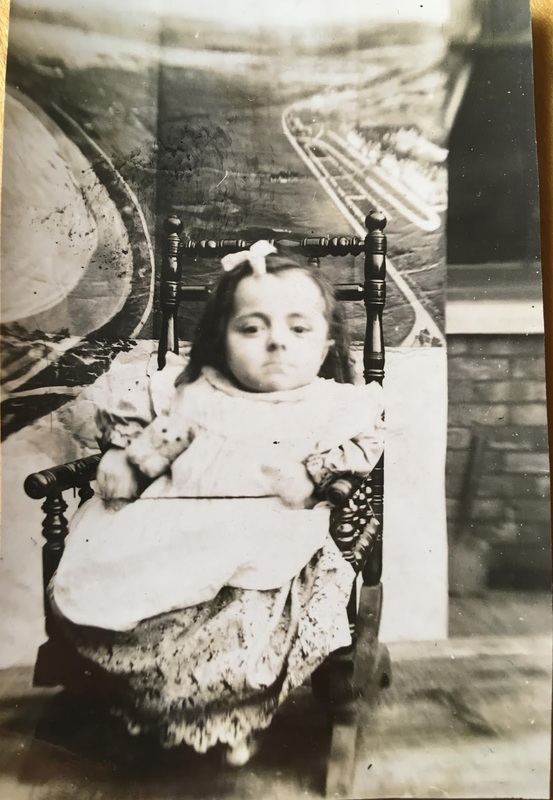 In the first she looks like she has another doll or toy on her lap. The second is clearer and she is again sat on the same chair and is gazing lovingly at her doll next to her- the doll is in a toy pram with a blanket over her. 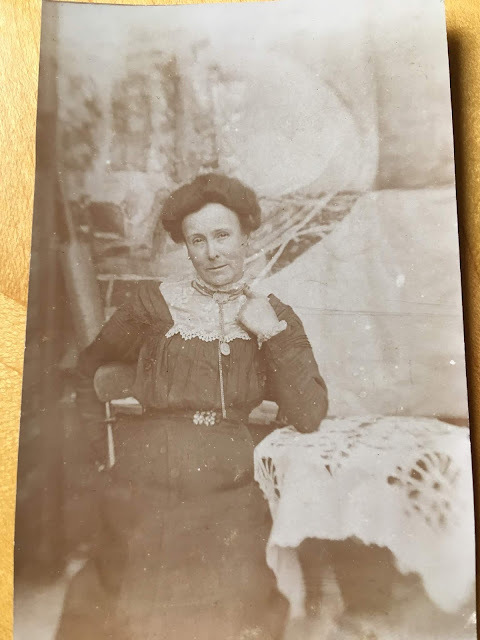 The girl is wearing the fob watch again but it must have been taken at a different time to the other photo with the watch as she is wearing a different dress in this photograph. I love the way she is looking at the doll. 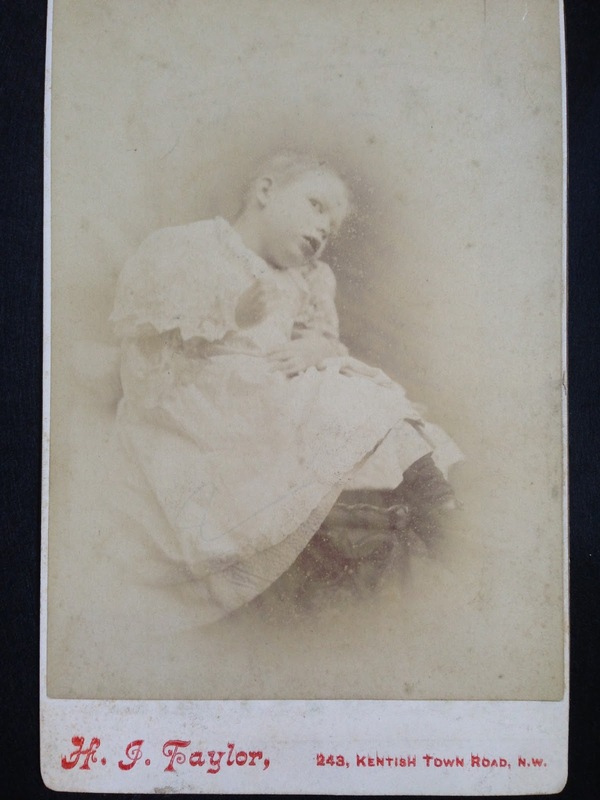 These two photographs were bought with the others. They date from the same time and probably show the girls brother and her proud and well-dressed mother. What I love about these photographs are the fact that they have been kept together. Again they show a little girl with a disability who has been kept in a loving home rather than institutionalised. I only wish there were more of her as she got older. Perhaps she did not survive beyond childhood, I hope she did. This bearded gentleman is from Peterborough, date 1880's? Cerebral palsy? 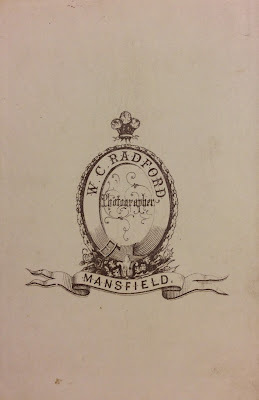 CDV, Eastmid Studios, back is blank. I love this family photo in the garden. 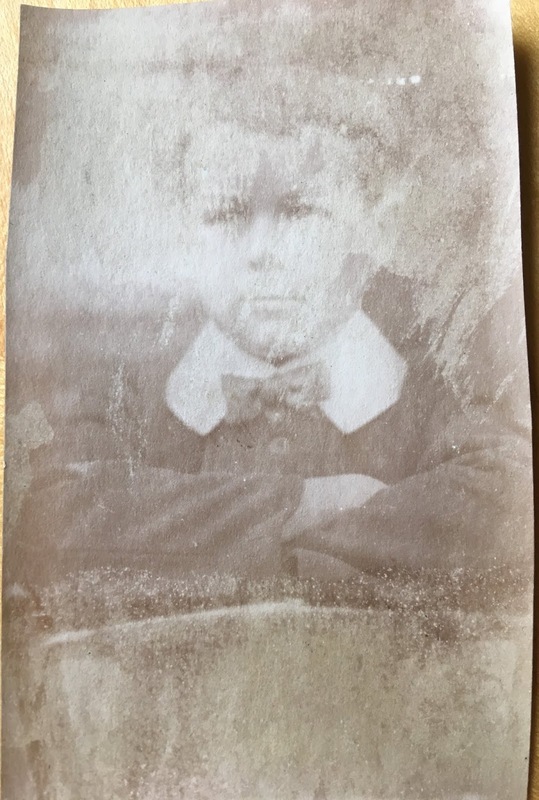 c1890? 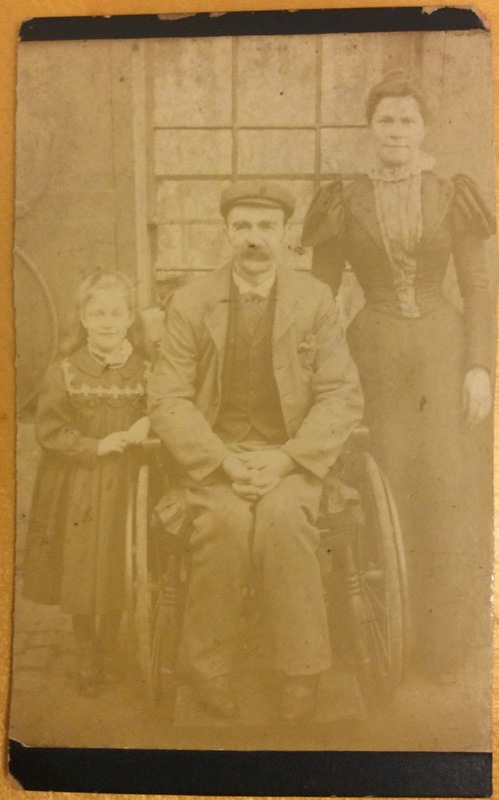 Note the wooden spindles of the wheelchair legs, it seems to be a household chair with two wheels attached either side. Back is blank. 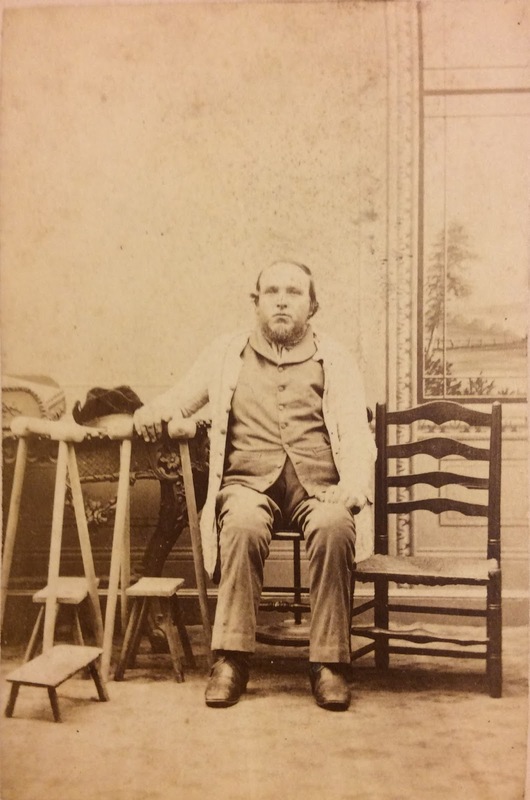 This studio photograph from the 1860's shows a man with two unusual three legged crutches. I assume he needs them as he has very poor balance. The three stools in the photo and the empty chair to his left are there intentionally. I would say he is a carpenter and they are there as example of the man's livelihood. 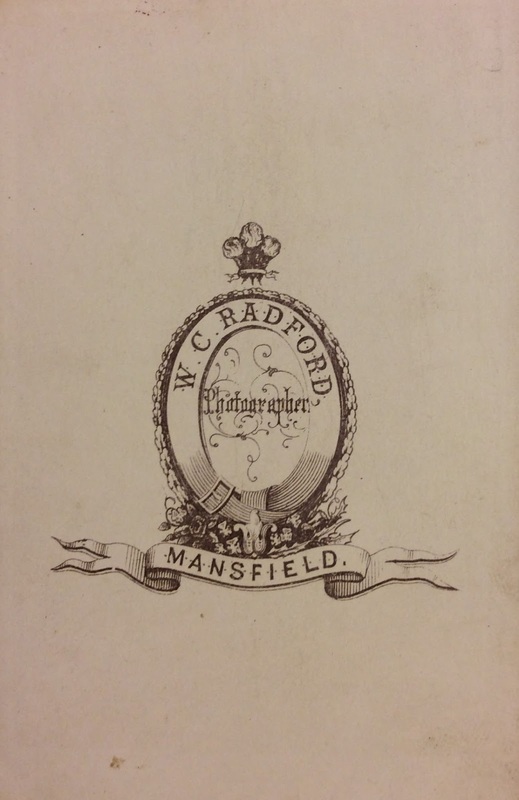 Photograph is from a Mansfield studio in Nottinghamshire. and I don't usually collect American photographs but this girl is from Minneapolis. Fred Palmer, CDV, back is blank, though it has 1885 pencilled on it. That's it! I own the photographs but wouldn't say there's any copyright on them so feel free to share and I'd be interested to know of any others.